Inside the Lumiere Theater. Apologies for “Britta’ing” this photo. Well, the Festival officially begins tomorrow, but today, I got a good taste of what I will be taking in for the next two weeks. I saw it all in the Palais, which is pretty accurately nicknamed “The Death Star.” It is an expansive place which has just about every theater where movies are shown. Most notably is the Lumiere theater, which puts every American multiplex to shame. The Lumiere is where the opening night screenings happen, and the stars walk the red carpet. It is where tomorrow night, “Moonrise Kingdom” will open the Festival. What movies I will see, and when, is still a mystery. The beauty of film festivals lie in the unpredictability. You could be going to a screening one minute, and then end up in someone’s yacht party the next. This is for an Indian movie. 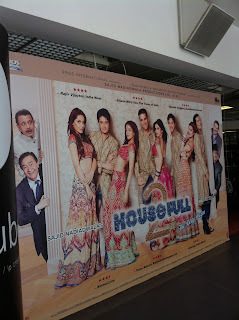 I’m not sure if the title is “House 2 Full” or “House Full 2.” If so, I still have no idea what this movie is about, and if it is either a Tyler Perry rip-off, or an Indian version of “Full House.” Either way, when does John Stamos show up? On display here are two equally fascinating displays of poster art. The one to the left is “American Hangover,” which looks like some kind of “Scary Movie” type movie. It stars Joey Fatone. Fatone is known by some as a member of NSYNC, by others as an actor in “My Big Fat Greek Wedding,” and by everyone as that guy who stopped being famous. 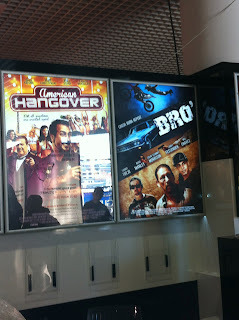 The poster on the right is for a movie called “Bro” which stars Danny Trejo. I mention this movie both because Danny Trejo is awesome and because I am afraid he will track down and kill me if I don’t mention it. If I don’t get a ticket to a red carpet showing, show up anyway wearing a tux. Witness Sacha Baron Cohen pull of a “Dictator”-inspired publicity stunt. Bring Harvey Weinstein coffee (even though I’m not his intern). Watch the James Bond movies and “Jaws” on the beach. Meet Anne Hathaway, Marion Cotillard, or Natalie Portman. Make a major acquisition deal. This entry was posted in Bollywood, Cannes Film Festival, Danny Trejo, Movie Posters, Sacha Baron Cohen, The Reel Deal Goes to Cannes on May 15, 2012 by ian0592.